Gloria Dei (Old Swedes') Church, Philadelphia, PA, 1828. Flip to Frontpiece to Kort abeskrifning om beskrifning om provincien Nya Swerige uit America...[ A short description of the province of New Sweden], by Thomas Campanius Holm, 1702. 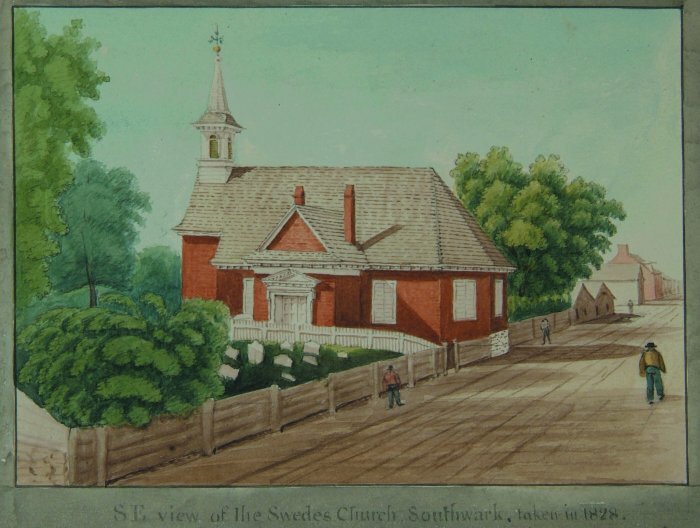 Consecrated in 1700, Gloria Dei is the oldest church in Pennsylvania and second oldest Swedish church in the United States after Holy Trinity Church (Old Swedes) in Wilmington, Delaware.